Whether you are interested in begonias for their flowers or for their foliage, the make beautiful plants for either indoors or outside. Start cuttings and tubers 2 to 3 months before planting them outdoors. Put the tubers or cuttings in planting trays or pots and then cover the pots or trays with plastic wrap and put airholes in the plastic. Keep the pots or trays warm and moist to touch out of direct sunlight. They are ready to move from trays when shoots of about 1 inch appear. The tubers should be turned so that the hollow side is up. This is also when you can divide the tubers by splitting them with a knife being sure to leave one or two buds on each divided piece. If you divide the tubers be sure to dip any cut surfaces in a fungicide. You can move tubers that you want to plant outdoors when all danger of frost is past. They should be placed in a cold frame. They can be planted in the ground in a shady area that has loose, well-drained soil that has been mixed with peat moss when the temperature does not dip below 50 degrees at night. It is best to use a watering wand so that moisture can be kept off of the leaves. 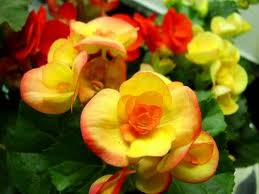 If begonias are kept indoors they must be kept at room temperature and strong light that is not direct sunlight unless it is winter. The easiest way to keep them moist is to place the pots on a tray with gravel and fill the tray just so that it comes to the top of the gracel with water. When the soil is dry to touch, add water. If you want to save tubers for the following growing season, dig them up before htey are caught in the first frost. Let the foliage die naturally by placing them in a dry place and then clean and store the tubers where the temperature will remain between 50 and 60 degrees. This is a good idea for people wholike to have the begonias outside during the summer and early fall, but whose winters are too cold for them to survive. Wax begonias are the only ones that like brighter light but still not direct sunlight. For hanging pots use trailing tuberous begonias.